This is one of those books everyone wants to own, everyone who is a fan of hairstyling talent, make up, and transformed stars, that is. 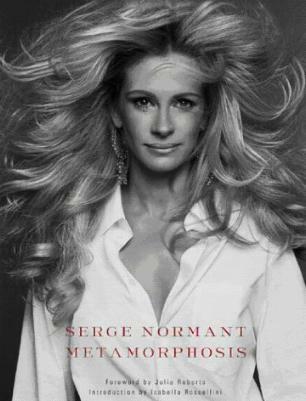 This cover picture speaks volumes about hairstylist extraordinaire, Serge Normant. Together with some very talented make up artists and quite phenomenal photographers, French-born Normant's work is exquisitely displayed in this superb collection of his art. It's not every day you get the chance to see Sarah Jessica Parker transformed into a Renaissance stunner, or Isabella Rossellini (whose interview with Normant is also included in the book) changed into an Indian woman and then into a Geisha. This is a celebration of an artist's creativity, inspiration, and the transformation of ordinary beautiful women into something quite extraordinary. There are spectacular pictures of women like Faith Hill, Cameron Diaz, Linda Evangelista, Julianne Moore, Shalom Harlow, Gisele Bündchen, Kate Moss, Ellen Barkin, and Bridget Hall among others. Not only is the hair fascinating but also the set decoration, the clothes and the costumes, the jewelry, and of course, the artistry. Julia Roberts penned the introduction for this book and is clearly impressed. Normant's work has been featured on countless glossy magazine covers the world over. Conclusion - Definitely one for hair artists and art lovers alike. Gorgeous.